Successfully Added Motorcycle Intercom - 800m Range, LCD Display, FM Radio, Bluetooth, Handsfree Calls, GPS Connect, HiFi Earphones, 400mAh to your Shopping Cart. Always stay connected to your fellow biker mates and passenger thanks to this motorcycle headset. Simply attach this sleek motorcycle intercom to your helmet, and you’ll be free to talk with your fellow biker friend. Supporting ranges up to 800 meters; this motorcycle headset offers convenient solutions to stay in touch while cruising down the streets. Coming with a pair of high-quality Hi-Fi stereo headphones, this motorcycle intercom is guaranteed to deliver great and clear audio while engaging in talks or listening to songs. Featuring a rechargeable 400mAh battery, this helmet intercom delivers up to 10 hours of continuous usage time. With all this power at hand, you’ll be able to head out with confidence on the longest of road trips. Additionally, it can be paired with your motorcycle GPS system, guaranteeing that you’ll never get lost again during your upcoming road trips abroad. Featuring a weather resistant design, this cool electronic gadget can be used in all sorts of environments and weather condition. Thanks to its Bluetooth connectivity, you’ll be able to effortlessly synchronize this motorcycle headset with your smartphone. Once connected, it allows you to engage in hands-free phone calls with friends and family back home – immensely increasing your on-the-road safety. 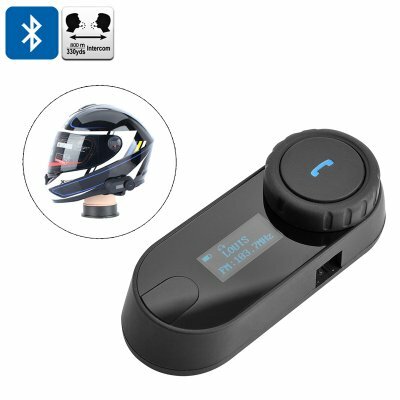 This helmet intercom can furthermore be used to listen to your favorite tracks in your mobile music library or through FM radio. Featuring a 10m Bluetooth range, you’ll be able to listen to songs and engage in hands-free calls without the need to take your mobile phone out of your bag pack – bringing along great efficiency and connectivity on the go. This motorcycle intercom comes with a 12 months warranty, brought to you by the leader in electronic devices as well as wholesale electronic gadgets..
Operating Range: Up to 10m for cell phones; 500m - 800m for intercom function.